We are delighted to announce our list of summer workshops for 2019. All courses take place in The Stables Gallery and surrounding gardens. A list if materials required will be sent with booking confirmation and some materials will be available to purchase. Tea and coffee are provided but please bring your own lunch. Basic kitchen equipment, including fridge and microwave, are available for use. If you would like to book on any of the courses, please complete the booking form and further details will be sent to you. We are delighted to welcome Josephine Trotter as guest tutor to Old Sleningford. Rooted in the tradition of modern Post-Impressionist painting she has her own totally individual vision. Jo lives at one with the landscape that surrounds her in the Oxfordshire hills. 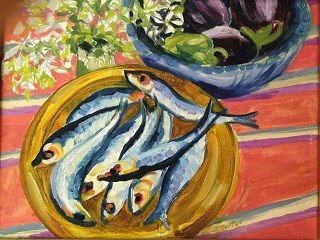 She largely paints landscapes but also still- lifes and portraits, all expressed in radiant colour with exuberance. Tutored in her early years by Maurice Field (1905-1988) she then trained at St Albans School of Art and Chelsea School of Art, graduating in 1961. Jo has had 22 solo exhibitions in London galleries. 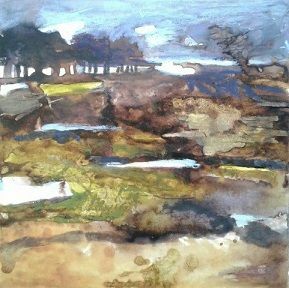 This two day course will explore drawing as a process of describing a subject using mark making and a wide variety of media. This weekend is designed to compliment and help free up existing skills and offer a new approach to image making. All levels and abilities welcomed. 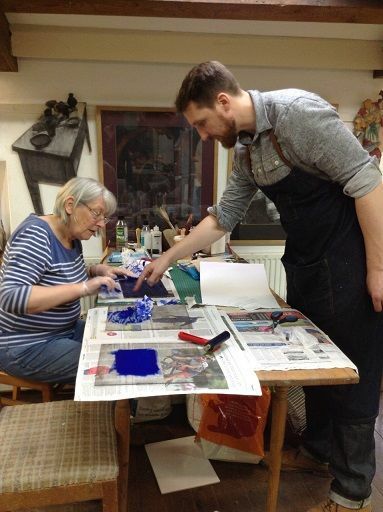 We will make use of large and small drawing surfaces with a variety of media - inks, charcoal, pencils, crayons, glue, egg tempera, gesso, printmaking, sgraffito. Day one will be focussed on the exploration of materials and new ways to make marks. Participants should expect to get messy. Day two will make use of the skills acquired on day one to draw a life model. We will aim to have a completed series of images by the end of the weekend which make full use of the new processes learned over the two days. Have you ever heard people say how difficult it is to paint with watercolour, and been put off? Have you tried – and given up because you didn't enjoy the results? Would you like to give it a go? During this weekend we'll look at materials and try out a variety of techniques . We will use other water-based media too and explore what pleases us as individuals. We shall be studio-based, so do bring any photos/sketch books. Our aim will be 'to boldly go' – not necessarily to arrive at a finished masterpiece! This statement will provide the focus for our work from the local landscape. It was the mantra of Jawlensky when he was part of the wonderful Blue Rider group of artists, founded by Kandinsky near Munich in 1911. Their aim was to react to their subject matter by making colour personal rather than local; a uniting of what they saw outside with what they felt and believed inside. We will take a look at the early work of Kandinsky, Jawlensky and Gabrielle Munter and also explore paintings by more recent artists including Milton Avery, Grace Hartigan, Brian Rutenburg John Hoyland. We will start the workshop with charcoal drawings, to establish simple form and composition before moving quickly into rich pastel work. On day two we will each create a personal palette of colour, searching out relationships that express our responses to the surrounding landscape. The workshop will be team taught by Eleanor White, Director of Bridge House Art and Phil Archer, Principal of Leith School of Art. It will be a reuniting of two old friends after twenty years of leading their own art schools. Oil paint is a drawing medium of great fluidity and plasticity. 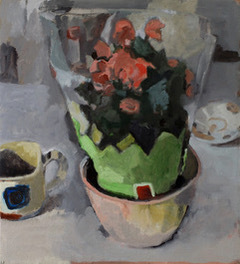 In this course you will start with simple use of tone to investigate the spaces created within still life arrangements. 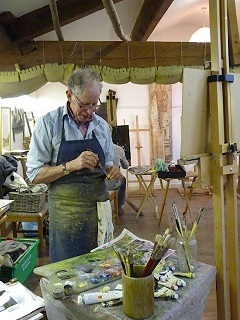 This will develop into how basic earth colours and a limited palette can produce paintings full of light and space. 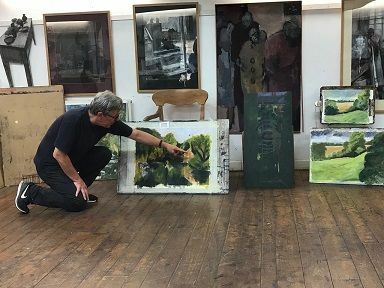 You will learn about paint mixing, mediums, grounds, using a limited palette and the range of colour you can develop from that. You will be drawing from the object and focusing on the composition. You will also find out how flexible and subtle oil paint can be.